It’s late. It’s dark. You get up and flip on the light switch and... roaches! Has this happened to you? Then you already know you have a roach problem. But the signs can be a little less obvious. Cockroaches are nocturnal and can hide in tiny cracks and spaces. Have you seen telltale droppings? Shed skins? Egg capsules? Remember, for each roach that you see, there may be hundreds more unseen and lurking. Don’t share your home with roaches! Call the professionals at Suncoast Pest Control for a free inspection. Since 1993 we have helped rid homes and businesses across Florida of their roach infestations. Our Technicians are highly trained and highly experienced, and we hate roaches as much as you. Roaches have been around for over 320 million years. 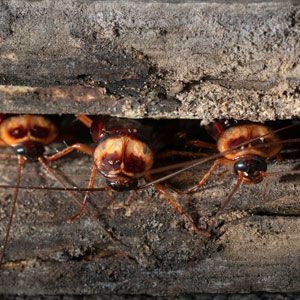 They’re not going anywhere – unless you call Suncoast Pest Control at (800) 270-3086 today.